I find it difficult to articulate my glee upon first using a wet palette. It’s something like getting your first car. You suddenly have freedom to try new things and see how far you can go, to push yourself to your limit. Wet palettes, in my eyes, are a near must for any painter. However, eventually I got a bit tired of having to keep chugging through baking paper and frequently setting the damn thing up. That’s when I saw an advert for the Everlasting Wet Palette from Redgrass Games. I plunged in head-first reckoning that this might be one of the best hobby investments I’ll make in some time! Let’s see if there’s truth to that. For those of you unaware, a wet palette allows you to thin your paints seamlessly whilst slowing the drying rate. Typically, you’d get a tupperware box, some kitchen roll, a bit of baking paper and add some water. Boom! Your homemade palette is ready to roll. However, if you’re happy to splash the cash on a wet palette made by professionals, you’d end up with something like what we have below. The Everlasting Wet Palette comes in a generous size, that’s excluding the XL option which is vastly bigger. The instructions make it as easy to use as a homemade wet palette but with longer-lasting results as well as easier use. To prep, you simply put into the tub a sheet of the foam provided which is both hydropholic as well as mold-resistant. You add a generous amount of water to get a thin layer of water atop the foam and then add the provided hydration paper. Once it’s on flat and wrinkle-free it’s ready to go. The low-height design of the palette means it’s effortless to get your brush to where it needs to be. No more leaning your hard awkward over a high-rise takeaway box! The items all work together right out of the box and providing you don’t use too much water then there’s little possibility of error. I backed this product on Kickstarter and received a number of accessories. I got a wavy which acts as a brush-holder as well as a small palette for inks and washes. It snaps onto the palette with magnets and, well, you can’t really go wrong with it. The palette also comes with an elastic strap which you can put over the whole thing to keep it together. I’d not advise waving it around or anything at the risk of your paints running/smearing all over the thing. Another noteworthy point is that you can simply put the lid back on to keep the palette wet over time. Now, in a lot of the UK right now we’re experiencing something of a heatwave. Where I live is no exception and I was devastated at the thought my palette I set up drying out due to this heat. 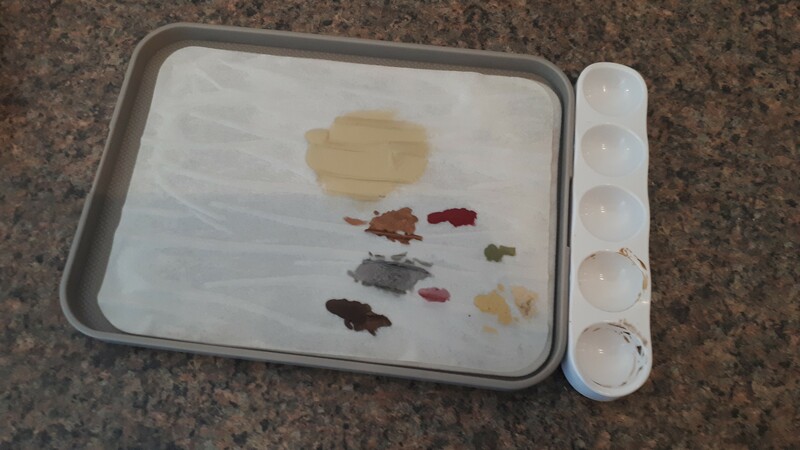 To my astonishment, I lifted the lid up and the two days of 26 – 28C degree heat has done nothing to dry the palette out. I was very, very impressed. I was provided with two sheets of hydration foam and 150 sheets of the hydration paper. Ideally this should last me a long, long time. Another nice touch is should you be painting alongside a fellow hobbyist the lid can act as a second palette. It’s not exactly a unique selling point, but it’s a lovely consideration for those love to hang out and paint. I can understand people’s befuddlement at the prospect of paying for a wet palette when you can make one yourself for pennies. This is absolutely an item of convenience. The quality of the product is unquestionable and it certainly provides wonderful results. Sure, there’s nothing to stop you slapping one together with your household items. However, if you have some extra income and want to make your hobby life a little more convenient, I’d certainly advise grabbing one. I’ve used mine for about two weeks now and the paint shows no sign of drying. 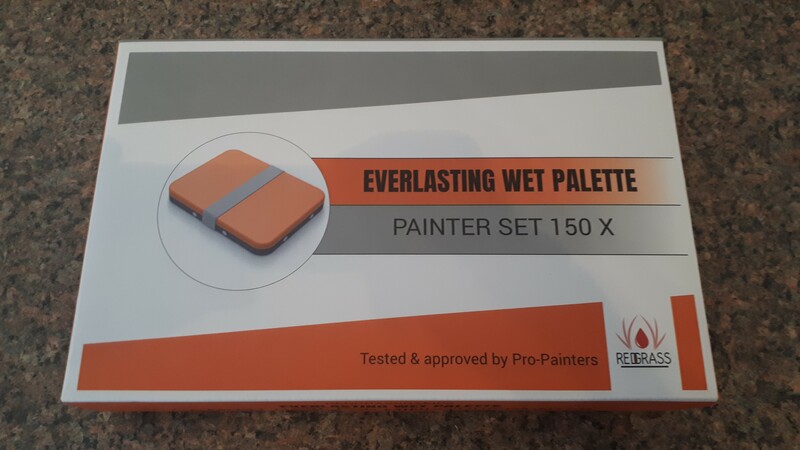 I will be making use of Everlasting Wet Palette for every project for the foreseeable future. This is due to its unquestionable convenience and quality. I’ve never really followed Redgrass Games much before but I’ll certainly be keeping both eyes on them in the future. If their future products are as reliable and high-quality as the Everlasting Wet Palette then I expect great things!